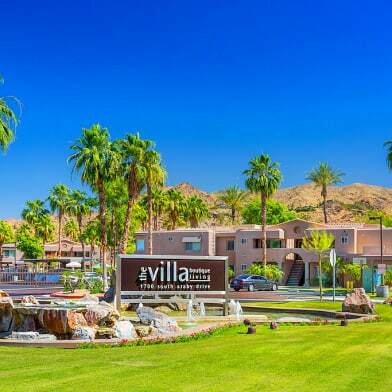 Stunning 2 bedroom + Den condo perfect for a relaxing trip to Palm Springs! Den features closet and pull out sofa. Only about 20 steps away, take a swim in the vast community pool and relax in the spa looking while gazing at the mountains and stars. Entertain on the large patios featuring a fire pit for those chilly nights and Infrared BBQ, modern decor, updated kitchen and bathrooms, tile and carpet, and fruit trees outside your front door! Condo has been tastefully decorated for your enjoyment. Living area and both bedrooms open to the front courtyard! Master Bath features a soak in tub and walk-in shower. Second patio extends the dining area perfect for dinner under the stars. You're only blocks away to the fun of Downtown Palm Springs, stores, shopping and parks. Book your coveted destination today! Have a question for 462 N Hermosa Drive?